The ORAC value of the following spices-herbs-foods are rated very high and are worth considering for your overall health and well-being. ORAC units measure antioxidant capacity of foods. Higher ORAC value units potential for better health. The following list consists of high ORAC value food and spices. Consider making an effort to obtain and consume more of them in your normal diet. Note: The ORAC values in this list are normalized to 100 grams of weight (~ 3.5 ounces) because that’s how the original database of information was presented. The intent is to ‘normalize’ the various items to simply compare ‘raw value’, NOT ‘amount per serving’. Note: This ORAC list does not factor or attempt to suggest the quantities that a person would normally eat in one serving (for example – who is going to eat 3.5 ounces of cloves in one serving??). 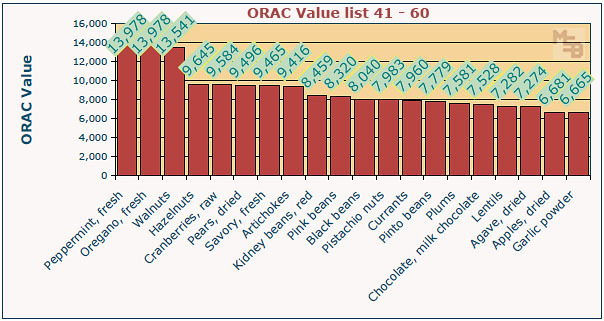 I simply intend to point out which ‘foods’ are literally the highest in ORAC value (that I could find information about). Note: The ORAC value of a given food will vary due to growing conditions, processing conditions, specific variety and others. Note: Data sourced from the US Department of Agriculture during 2010. The USDA recommends an ORAC unit ingestion of about 3,000 to 5,000 units daily. Note: ORAC values listed here are in units of µmol TE/100g (micromol Trolox Equivalent per 100 grams). Trolox equivalency is used as a benchmark for the antioxidant capacity. Update: Sometime during 2012, the USDA apparently removed their ORAC listings. Again, this ORAC list does not factor or attempt to suggest the practical quantities that a person would normally consume in one serving. It simply is an attempt to point out the ORAC value for each ‘food’ (at least those that I could find information about). @MSB, You are outstanding in your range of thoughtful coverage. Thank you for doing the work above. Only things I could add are look at labels. Bulk purchase prices are often better. Look for the location of origin. Lastly, buy organic whenever you can. Could you please tell me which measurmental units are used for your ORAC scale chart? Thanks for publishing! ORAC (Oxygen Radical Absorbance Capacity) units, a unit of measurement for antioxidants developed by the National Institutes of Health (NIH). The ORAC value is expressed in micromoles of Trolox Equivalents per 100 grams (about 3.5 ounces) of sample (this is the laboratory measure of ORAC). Also, I have found some variations of actual ORAC values per food item when searching various ORAC tables, although most of the lists seem to be reasonably similar. Differences probably have to do with exact format of food, quality, variety, etc. Catnip was (and still is) used for colic in babies, and as a mild sedative, and has digestive uses (gas). Sometime in the 80s the mainstream medical folks started cautioning against its use in babies because you couldn’t necessarily know the strength of the plant. As a tea, from the fresh or dried leaves. I was a pediatric nurse for about 30 years and have been a student of alternative and herbal medicine for much of my life. Could you please tell me what the standard dosage is that was used to generate the chart? Was it 1 tbl or 1 oz or what of all the foods and spices? 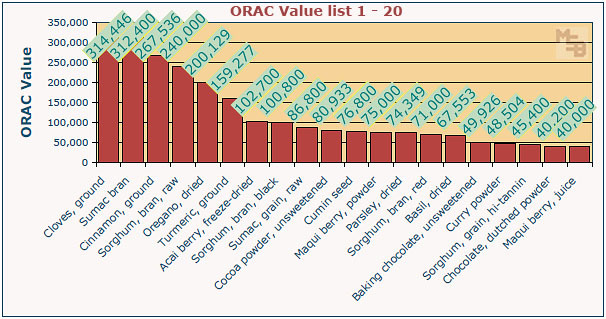 I’m assuming you used the same measurement (1 tbl, 1 oz) of all the foods and spices to obtain the ORAC value comparison? Thanks much. –> per 100 grams (about 3.5 ounces), apparently the standard laboratory measure of ORAC per the NIH. Knowing the standard amount of measure does put some perspective on each item, although it does not detract from its overall apparent ‘goodness’ for your health. For example, No-one eats 3.5 ounces of cinnamon at once — in fact it would be VERY unwise to do so because 3.5 ounces of cinnamon would be an incredible and unnatural amount – and it thins your blood. In this example, it would probably be smart to limit to no more than 1 teaspoon daily depending on your medical condition (always consult your doctor), etc.. But this is mostly common sense for most of these items on the list. Always know what you are consuming and the potential side-effects. Do your due-diligence and discover this information for yourself and how it may affect your unique condition. And as always, “consult your doctor”. Do you have ORAC info on muscadine grapes? A quick google search indicates that it may be about triple that of blueberries. Looks good! I’m glad this older article was brought up, since somehow I missed it when I went through the archives. Very enlightening information. I compared the top 100 list to what I grow and eat from my garden. It looks like I have pretty good coverage; about 40 out of 100. But I see room for improvement too. I’m adding 5 or 6 trees this fall, fig, orange, plum, and some more nut trees. Possibly a lemon tree. Although the citrus fruits aren’t on the top 100 list (I think they fall somewhere around 2,000 units), they grow really well here, as opposed to say blueberries, that don’t like the climate here at all. I’m trying to include high ORAC value foods that are also packed with other nutrients, such as the Vit. C in oranges. Consider ‘Misty’ blueberry, developed by the U. of Florida. Delicious, early, and has a heavenly scent that perfumes my garden. Red bell peppers are very high in Vit C, but I have better luck with citrus trees than pepper plants. Hot peppers will grow like weeds for me but bells don’t like me, even though I try every year to grow them. Same with beans, they won’t produce for me, so I rely on canned or dry beans. I really like the things I only need to plant once, perennials and trees. Almost everyday for the last five months, I drink tea composed of cloves, cinnamon, green tea, and cardammon (personal recipe). Cloves are strong so I try to take 1 gram a day of it. I’m glad I found this page. It strengthens my commitment in drinking this tea everyday. I can’t believe Chia seeds aren’t on the list. @shannon, a little research reveals that the ORAC value of chia seed is about the same as blueberries, maybe slightly higher. Chia seed ORAC value apparently ranges from 6000 to 8500 μmoles (TE/100g). Why isn’t pomegranate juice on the list? barley grass has gaining popularity in our place, is it true it has 25,500 ORAC value? Do you know the ORAC value of the herb Ganoderma Lucidum found in the “Red” mushroom? how about purple corn extract? I have done a lot of research on Purple Corn. When someone is saying 10,800 for Purple corn they are only talking about the whole kernels of Purple Corn and not the extract. The extract is actually 10 to 20 times that amount. 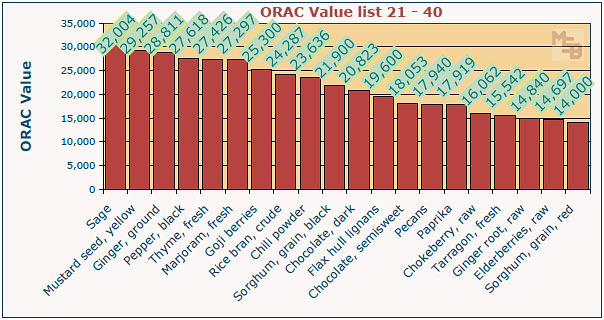 The ORAC value of Purple Corn is way higher than even ACAI. All purple colors have high Orac values. While this is a helpful table, it is not a practical one. The ORAC values should be also be listed by physical sizes, such as a quarter of tsp of cinnamon powder, 1 whole pear, etc. to make for practical applications and to compare apples to apples so to speak, no pun intended. @jane, you are correct that a new list which takes into account an expected ‘normal’ intake (or serving) for each ingredient (which is different from one to the other) would be helpful for ‘practical’ use – the amounts which would represent a reasonable daily intake. The current list is ‘normalized’ such as to compare each food’s ORAC goodness based on the same quantity (100 grams). 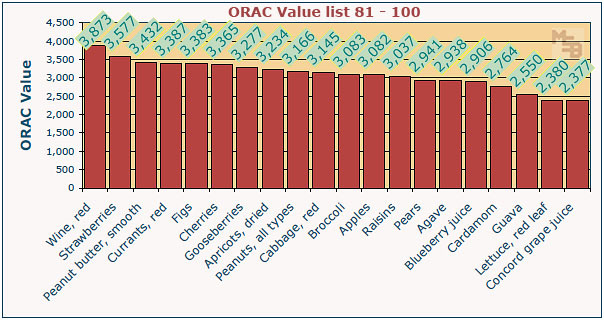 A quick web search indicated that purple corn ORAC value is 10,800 (per 100g), which would have put it in the middle of this list, just above Hazelnuts. That is strictly for 100g of whole kernels (raw) of Purple Corn. If you are talking about the extract (which is what most of the ones that are listed on this website) are the extracts. If you take the same amount of EXTRACT with this other it would be over 2 million on the Orac value. Way more than Acai. There are studies that are coming out about Purple Corn and its benefits. Remember antioxidants fight rheumatoid arthritis so pass the orac list to them and they can eat their way to a better life! I was recently researching the ORAC scale/list as I was also researching the health benefits of Cacao nibs. However, it is disappointing to learn that both the USDA and the EFSA consider these values to be biologically irrelevant, and as has been pointed out by numerous comments left here that there seems to be no standardization or comparison when measuring the ORAC value. What’s more is that none of the ORAC level data has ever been peer-reviewed (please correct me if I am wrong, I have tried to find it), so actually could quite easily be completely inaccurate or in extreme cases made up. P.S. Forgot to mention that the USDA removed the ORAC assay from their site in 2012 for the reasons stated above. Interesting list! Cinnamon is that high, I had no clue! Has anyone checked out sugar cane juice? what I recall reading a few times, and being puzzled by it was apparently the persons (historically) who live in areas where sugar cane is grown routinely chew on pieces of sugar cane. ( I think slice a entire piece off and chew).. The puzzling part, I recall the writer questioning, was that these people did not seem to develop cavities or other dental problems, as might have been expected from high sugar product. also, this was fresh sugar cane, I recall being chewed. I also recall reading, at least a couple of times, of persons who had moved from areas where sugar cane was grown, to say, North America, and only being able to access the Cane in the local market. Both times I read about this, the persons said what they could buy in the market was no where close to what they were used to, and quite awful. Yes CHAGA is the king. How about the alaskan bleuberrys ? How do u feel about the kyäni products ? Would buying some of the various foods in powder form, combining them, then putting in to caps be a good idea? I just learned something about cinnamon, as my wife and I started to take this with honey as it is supposed to help with arthritis. Cassia cinnamon is what most of us have always been buying in grocery stores. Well, cinnamon is all the same. The nutritional value of cinnamon is from the Ceylon cinnamon. Chokeberry, powder orac value is how much ? why isn’t the green tea on the list??? i read that has more ORAC than wine. 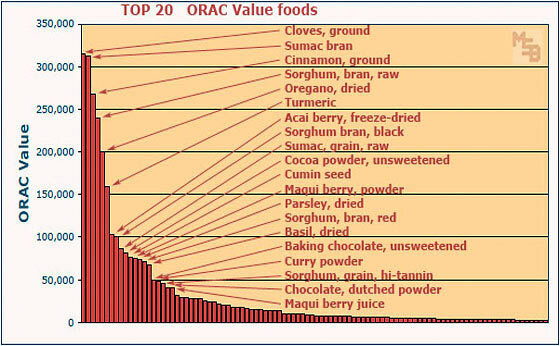 The ORAC values in this list are normalized to 100 grams of weight (about 3.5 ounces). The list is somewhat misleading when you factor in the quantities that a person would normally eat in one serving. For example – who is going to eat 3.5 ounces of cloves in one serving?? My intention with the list was to point out which ‘foods’ were literally the highest (that I could find information about). why are the ORAC values so different for dried herbs and fresh herbs like Oregano,Parsely and Basil. ORAC index say “yes… it reacts with free radicals but I don’t know if it can work into the cell”. Once you extract water from anything, you are left with a concentrated form of the fresh product. I’ve cleaned up this original article a bit, and re-posted for your information. Please elaborate on the Coffee Berry Fruit, since I have NO idea about coffee (non drinker) you perk my interest. The coffee bean is like the kernel of the peach pit, whereas the coffee fruit is like the peach fruit. Most people aren’t familiar with the coffee fruit, because it has mostly been discarded, such as for compost. What is now known is that it is an excellent food, particularly for the brain. Actually, it is an unbelievable brain food. To put it simply, if you use the coffee bean fruit or go on the ketogenic diet, your brain function will literally improve. And that’s regardless of your age. Fruits like blueberries and goji berries are extremely beneficial for our modern degenerative diseases and perhaps the coffee fruit with such a high ORAC score will prove of benefit in areas outside of the brain as well. Can you send a sample of Coffee berry…if yes pls confirm. I missed this article last fall. 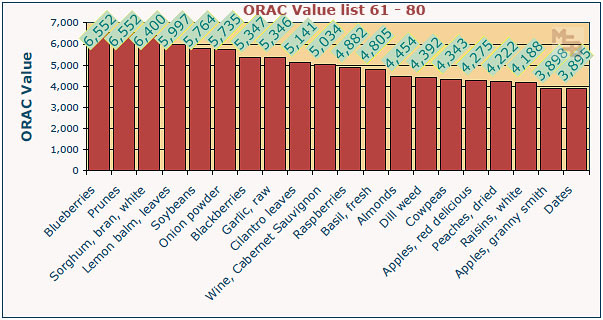 I made sumac tea from smashed Staghorn Sumac berries last November and didn’t think it was that high on the ORAC chart! I was going to grind the berries as a flour additive this year, but found other recipes I can try. you can grow Seabuckthorn. it is a tallish shrub, and you need one male/one female. if anyone decides to grow Seabuckthorn, you are supposed to have one male/one female. they seem to send out lots of “runners”/”shoots”, so try to find a spot they can expand. Is there a recommended number of orac points to achieve per day? I just acquired a newly released vitamin/mineral supplement that is 100% natural, organic, and gmo free. It has an orac score of 160,000 per serving!!! I’m happy to share if interested. Just wondering if you could send me the name of the vitamins to which you refer. I have been taking a liquid supplement, Vemma, which is no longer being shipped due to financial issues. Vemma, countains mangosteen, and the supplement itself offers an ORAC value over 100,000.
susan g – they are BTT 2.0 capsules from Youngevity. Check them out and enjoy. Tomato and Goumi didn’t make your list. Great info, hard to do it all. But a little goes a long ways of these high orac spices etc. Eat a least 4 or 5 each day. Moringa Food supplement is highest ORAC in the world, it is fact. It is a very informative list. I came across Sea buckthorn jam with sea buckthorn listed at around 70,000 and hence curious of getting the comparison list. I also take almond, pumpkin seed, cashew as snacks. I dropped chia seed because it is said that chia seed is no good for prostate. By the above, what is my estimated consumption, which now seeing the list, the aggregate daily intake seems to be way exceeding the limit to me. What could be the side effect, if any? Would very much appreciate your comments and advice. That soy milk caught my eye also. Soy is best avoided. It is not a healthy food. It is also the highest mucus causing plant food of all common foods. But, your reliance on the TSH test needs to be taken with a grain of salt. It is one of the poorest of tests, often showing normal, despite an abnormal Thyroid or Pituitary Gland. Also the TSH, which is a Pituitary Hormone, assumes that the Pituitary isn’t malfunctioning and there is no justification for that assumption. It is plain and simply a guess. William….first off, listen to your body…if you start to feel you need a break from some of these, maybe you do. second..check out cinnamon…there is an ingredient in cinnamon (cant recall name) which can cause bleeding and kidney damage. there are at least two basic kinds of cinnamon, and one is worse for this than other. A bit of it on your pudding..no problem.. Spoonful taken every day, needs checking. and that soy..yes very estrogenic…however having said that, (and you really would need to research this, as it is a passing memory of reading)….some men who have prostate trouble are treated with some type of estrogen…so ..well, check it out.. True cinnamon is usually labeled “Ceylon cinnamon” and comes principally from Sri Lanka, India, Madagascar, Brazil and the Caribbean. Cassia, on the other hand, is often designated as “Chinese cinnamon” or “Saigon cinnamon” and comes principally from Indonesia, China, Vietnam, Japan and Korea. Cinnamon is one of the oldest spices and most popular spices, and has been used for millennia both for its flavoring and medicinal qualities. In ancient Egypt, it was used to fill body cavities of corpses as an embalming agent. In ancient Rome it was considered so valuable that the Emperor Nero burned a year’s supply on his wife’s funeral pyre as proof of his devotion to her. Ceylon cinnamon is more expensive and more difficult to find in North American where most spices labeled cinnamon are actually the cheaper cassia. Sweeter, lighter and more refined than cassia, true cinnamon is most suitable to flavoring desserts rather than more robust, savory dishes which can handle the heavier cassia. Besides flavor, the most important distinction between the two spices, however, is in their levels of coumarin, natural compound that acts as a blood thinner when ingested. Cassia has much higher levels of coumarin than true cinnamon. Patients on blood thinners such as warfarin (trade name Coumadin) are often advised to limit their intake of cinnamon, but this generally applies to cassia more so than to real cinnamon. Both types of cinnamon are excellent sources of the trace mineral manganese which is an important activator of enzymes essential to building healthy bones as well as other physiological processes, including carbohydrate and fat metabolism. They are also both very good sources of dietary fiber, iron and calcium. The combination of calcium and fiber is thought to be helpful in reducing the risk of colon cancer and lowering cholesterol levels, and relieving constipation or diarrhea. What about Spirulina and Chlorella what is the value of orac on them ? What about spirulina and carob. What this shows is that Beans are the king! Lentils, + Tumeric + cumin = superfood maybe even throw some chilli in there and your ORAC value is going to be really high for really cheap. Add rice and you have a complete protein. What about Matcha green tea? A essential oil concentrates something’s by 3, so by that estimate clove oil in solution of a carrier oil say olive oil would be close to an orac of 1,000,000. Tart cherry juice has a very high orac value and that is not listed on your chart. Not to be confused with just cherries. The tart cherry juice is where the high orac value is. Interesting that the sorgum bran is so high, i am curious what it is cooked though, raw sorgum bran doesnt sound too appealing, but sorgum bran baked into flat bread or something like that sounds great. NRP; After those cinnamon rolls with the sugar glaze all over them, you will be sticking to everything else, not just your story. HAHAHA, probably, I have been known to devoir a C-roll or ten, BUT those days are well over, One pound per week, GONE!!! and it stays off. Sorry NRP, I couldn’t help it. Does anybody know the ORAC value for Ashitaba Plant and Mangosteen Fruit? Or better still, the Sap of Ashitaba and the Pericarp of Mangosteen.